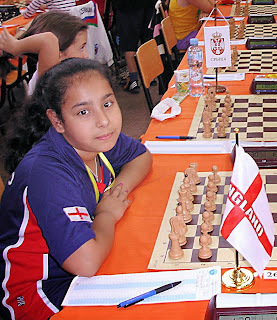 The April FIDE Rating List, published today, shows 9-year old Anita Somton in 59th place amongst active English women, with a rating of 1468. She is the youngest English girl to have a FIDE rating and has the highest rating in the whole of the UK for a girl born in 2004. This weekend she plays at Daventry in the ECF Junior Squad Championships. 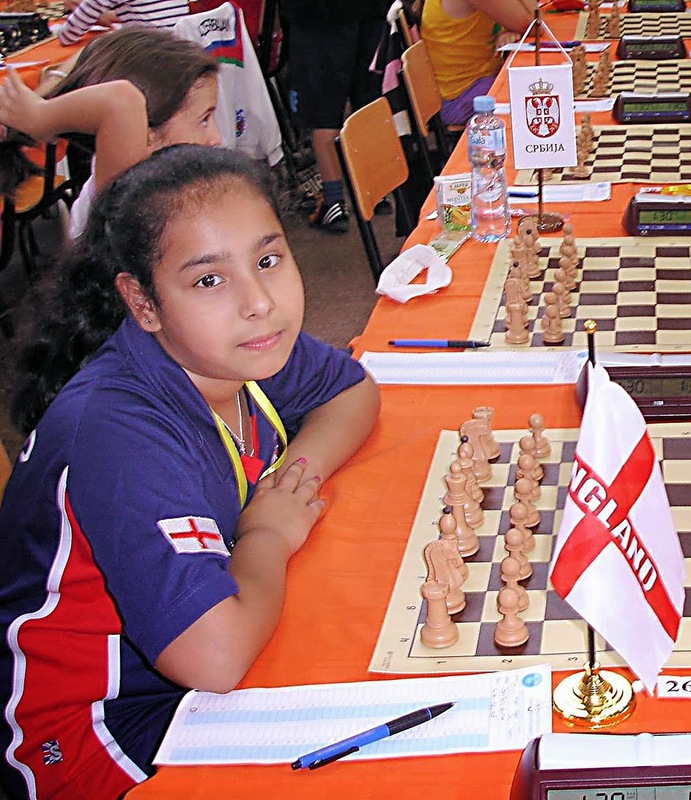 She will be attempting to repeat last year's success when she became the English Girls Champion (Under 9), based on her best three qualifying tournament performances in the English Youth Grand Prix. She will celebrate her 10th birthday on Sunday. 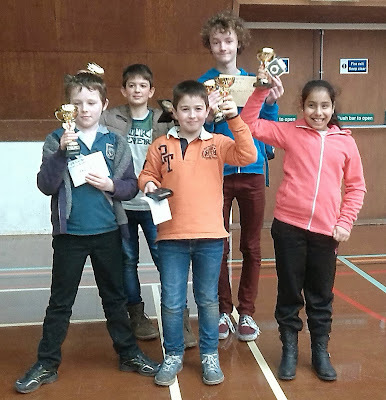 Having finished as runners-up in the EACU County Championships (see report here), the Suffolk First Team will play Somerset, winners of the West of England Chess Union competition, at Milton Keynes on Sunday 18 May. The match will be a quarter-final in the Minor section, for which there is a maximum average grade for the team of 180. Ian Wallis, team captain for the EACU competition, has handed over the reins to me (Bob Jones), and I have been in contact with the Somerset captain to agree the venue and timings. Milton Keynes is roughly halfway between Ipswich and Bath; it takes about two hours to drive there from Ipswich. The match will commence at 13.00. It also falls to me to select the team. 18 players have said they are available (what luxury, not having to chase people to play! ), so two will be disappointed. I will be sending out the team list shortly. Our opponents are likely to have quite a strong team. In their last WECU match on 8 March against Hampshire, Somerset fielded a 212 and 211 on the top two boards, and the full team averaged 179. Unfortunately I will be on holiday in Scotland on 18 May, so Ian will return to the captain's role for the day. If we are successful we will go forward to the semi-final, which is scheduled for Saturday 14 June (although it could be arranged for the following day, by agreement). The Final will definitely be on Saturday 12 July, but perhaps it's a bit early to start thinking about that. The only two teams capable of catching Manningtree, Ipswich A and Ipswich C, fought each other to a standstill last night, drawing 2 - 2. This means that neither can now win Division 1. Ipswich A are four points behind, with a match in hand, but even if they were to win that match 4 - 0, they would have fewer wins than Manningtree (see Rule 28 which defines what happens if teams are tied). So it's many congratulations to Manningtree, one of the smaller clubs in the Suffolk League!. It's the first time in their history that they have been Suffolk Champions. When they come to Bury for their final match of the season on 10 April, the obligatory winning team photo will be taken (and published here). Manningtree's only loss during the season was at home to Bury St Edmunds A, in December. The photo below appeared in last Thursday's edition of the East Anglian Daily Times. It was sent to me by Rani Pert (mother of Nick and Richard) who suggested that the lad on the right is Simon Lunn. I think she is right. But does anyone know who the others are (and confirm it is Simon, who would have been nine years old at the time)? 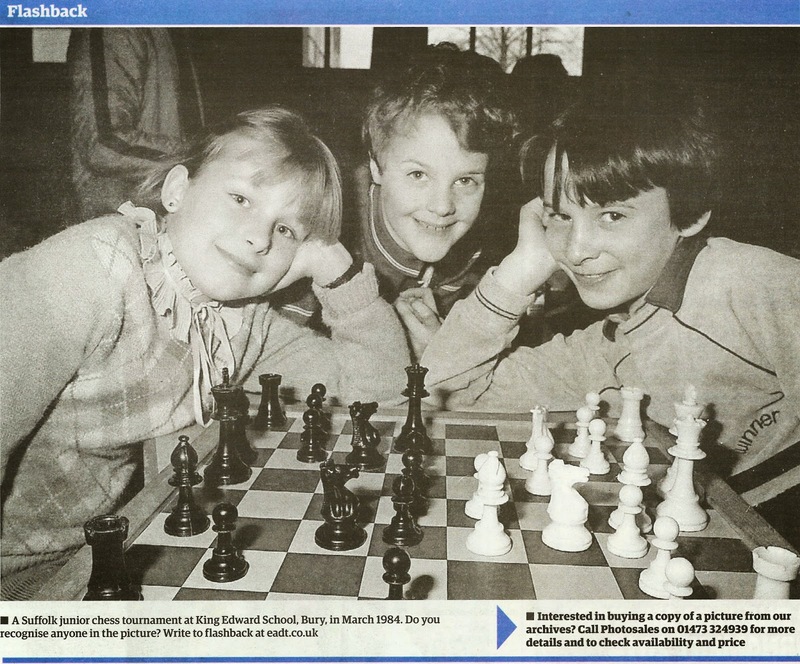 As you may be able to make out from the caption below the photograph, it was taken in March 1984 at a junior chess tournament at King Edward School in Bury St Edmunds. There's plenty of Suffolk interest in Division 1 of the Bury Area League. Not only are there three teams from Bury St Edmunds, but one of those teams, Bury Scorpions, consists entirely of players from Ipswich. Captained by Ian Wallis, the Scorpions are having a fundamental effect on which team ends up as League Champions. Last Tuesday they managed to draw 2 - 2 against leaders Linton A (with Shaun Munson beating CM David Coleman 204). This put a spoke in Linton's wheel and they now stand just 2½ points clear of their nearest challengers Cambridge Examiners, who have a game in hand. And that's not all. Next Thursday, Scorpions entertain Examiners, who will be anxious to leap-frog Linton and claim top spot, with both teams then having one more match to play. At the other end of the table, Ely appear doomed to relegation, despite having one or two matches in hand over the teams immediately above them. Manningtree A played this evening against Bury St Edmunds B. Both teams were desperately seeking points, but for different reasons. The result was a draw, which leaves Manningtree needing just one point from their final match, against Bury St Edmunds A on 10 April, to claim the league title for the first time. The other five teams in Division 1 are separated by only 2½ points, with the bottom two teams having an extra match to play. Things couldn't be closer! The top four teams have one match each to play. Manningtree A are top on 21½ points. Ipswich C are second on 18 points, Bury St Edmunds B have 17 points and Ipswich B 16½. The other two teams, Ipswich A and Bury St Edmunds A have two matches to play, and are both on 15½ points. Manningtree A cannot be relegated, but any of the other five teams could face the drop. As the season draws to its conclusion, promotion and relegation issues will begin to be finalised. Yesterday's results saw Bury St Edmunds D win Division 3 of the Suffolk League, following a 3 - 1 win over Stowmarket Rooks in their last match of the season. Nearest challengers Clacton beat Felixstowe 2½-1½, but that leaves Clacton 4½ points adrift, with just one match to play. Bury D's captain Scott Taylor is relishing the prospect of playing in Division 2 next season, where he intends to continue as captain. Felixstowe's Phil Hopkins will be Division 3 Player of the Year; he has now accrued 9 points from his 11 games and cannot be caught. The title is not based on percentage score (as shown on Dave Wild's website), but on the total games won for the same team. A couple of weeks ago we reported on the sad death of Steve Collins. His funeral will take place on 28 March, at Chelmsford Crematorium. "I can confirm the following details for Steve’s funeral. It will take place at 10.30am Friday 28th March in the South Chapel at Chelmsford Crematorium. Writtle Road, CM1 3BL There will be a wake from 12.00 onwards at Chelmsford Social Club (Chelmsford Chess Club’s home chess venue). All are cordially invited to any part of the day. Please pass this invitation to others in your chess circle. Flowers will be from the family only and donations are requested instead of flowers for the Heart of Darts charity (who funded Steve’s hi-tech chair). There will be donation boxes at the funeral and the wake along with representatives of the charity. If anyone would like to donate who cannot attend feel free to forward the donation to me (as cash or a cheque made out to me) and I’ll pass it on in cash on the day. Please wear something bright – preferably red or depicting Liverpool FC. I saw Steve’s mum today and she was particularly keen to stress the day was to be a celebration of Steve’s life as much as mourning for his passing." Last Friday we reported on a quick win for David Spence at the recent Gibraltar Masters. David has also provided detailed annotations on a couple of positions from his games. 19. Rac1 I need to stop the rook infiltrating. I was doubting whether my extra pawn would be enough to win this notoriously drawish opposite-colour bishop endgame. ... Rxc1 20. Rxc1 Rc8 Black continues his quest to simplify and 'half out'. 21. Rc5! This keeps the winning chances alive ... Rxc5? Natural though wrong as now White has a 3 - 1 queenside majority, better than the previous 2 - 1 majority. 22. dxc5 Kf8 23. Bd6+! Part of a cunning plan to restrict the Black king. ... Ke8 24. c6! If Black were allowed to get in Bd7, he has hopes of drawing. ... Kd8 25. Kc3 Be4 26. Kd4! Exceptionally strong as Black cannot push his d-pawn in exchange for White's c-pawn. ... Bxg2 The pawn parity is irrelevant. 27. b4 Bf1 28. a4 Bc4 29. Kc5 The passed pawns cannot be stopped. ... Bb3 30. b5! Resigns. 16... b6. b5!+ was possible and more dynamic, however I was worried my c5 pawn would be too weak. 17. Qa4 Nd4 18. Bxd4 exd4 19. Nb5 Nd5 Black is slightly preferable, with the bishop pair and space. 20. Nbd6 b5! Just hoping I had correctly analysed I was winning material! 21. Nxb5 Qd7 22. Ncd6 Nc7 Overloading b5. 23. Qxa5 Nxb5 24. Ne4 Correctly keeping on his knight, rather than simplifying when material down. ... Rfc8 25. Rbc1 c4 26. a4 Qa7 Trying to simplify. 27. Qxa7 Nxa7 28. Nd6 Rc5 Clearly better for Black still. 29. dxc4 Rxb2 30. Rb1?! Rxb1 The cold-blooded Rxe2 is comfortably winning, though I was getting very short of time and needed to get to move 40. 31. Rxb1 Nc8 32. Nb7! Setting up a trick. Rxc4? Re5 is still winning. 33. Nd8 Now my IM opponent is blitzing me and threatening some nasty traps. ... Bf5 34. Bd5+ Kf8 35. Ne6+ Not the best move, though my opponent may be risking the whole point on me not making it through the next six moves in under one minute! ... Bxe6 36. Bxc4 Bxc4 37. Rb8 Decision time for Black: Ba6 or Be6? ... Ba6 I did not like the idea of the a-pawn marching home. 38. Ra8 Bb7 39. Rb8 Ba6 40. Ra8 Bb7 ½ - ½. A strange outcome, though 32... Rxc4 was risky for Black. The Suffolk Under 160 team played their final rounds of matches today at the Turner Hall in Newmarket. In the morning, Suffolk went down 6½ - 9½ to Norfolk, but in the afternoon convincingly beat league leaders Cambridgeshire 11 - 5. 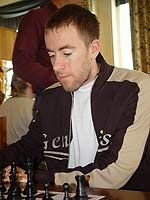 Simon Riley (Adastral) was the only Suffolk player to win both games. Those on 1½ points included Phil Hutchings, Leon Burnett, John McAllister (all Manningtree); Jon Collins and Laureano Garcia (Bury St Edmunds). The final league table will be published here when the remaining results are posted (Herts v Norfolk and Cambs). Suffolk finished in last place, having only won one match and drawn one. The 8-board Under 100 team (captain Dave Robertson) played two matches against Cambridgeshire, winning the first 6 - 2 but losing the second 3 - 5. As reported last month, Suffolk's David Spence had a successful tournament in Gibraltar this year, scoring 50% in an event packed with titled players. Next week, a couple of interesting positions from David's other games at Gibraltar will be published here. The FIDE World Chess Championship Candidates Tournament 2014 starts today, at the Ugra Chess Academy (pictured above) in Khanty-Mansiysk (Russia). The winner of this event will face off with the reigning World Champion Magnus Carlsen in November 2014 to challenge for the crown. The time control for the event is two hours for the first 40 moves, one hour for the next 20 moves and then an additional 15 minutes up to the end of the game with 30 seconds increment from move 61. The prize fund is €600,000 with €135,000 going to the winner. The games start at 09.00 GMT (15.00 local time). Click here (official site) or here (ChessBomb) to view the live games. 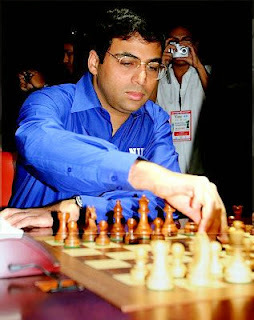 (Latest news: The only decisive game in the first round was Anand beating Aronian). So let's continue with this theme and have a look at board order. In the Suffolk League we are allowed to play 'out of grade order', provided there are no more than ten points difference. So, for example, a 120 grade could play on a higher board than a 130. Things get a little more complicated when the new grades come out in January. For league matches, we use the new grades to determine board order, but for graded competitions such as the u125, we still use the August grades for eligibility purposes, although the January grades apply for board order. This all seems rather complicated. Is there a better solution? Should we play in strict board order and allow no tolerance? Should we use the August grades throughout the season and ignore the January grades, as far as board order is concerned? Several years ago we were allowed a 15-point margin, but this was reduced to 10 points at an AGM. Is 10 points the best answer, or should it be more, or even less? The 20-board Suffolk Under 11 team will be playing on Saturday in the East Zone of the English Primary Schools Chess Association (EPSCA) Inter-Association Championship, taking place in Chingford, Essex. As last year, when Suffolk 'borrowed' players from Norfolk, this will be repeated with four Norfolk players amongst the top ten boards. The remaining 16 places will be filled equally from the Bury Knights and the Abbey Prep (Woodbridge). It's a sad reflection on Suffolk Junior Chess that a) we are having to use players from Norfolk, and b) that there are no representatives from schools in Ipswich, the county's largest town (by far). The rules allow Norfolk children to play for Suffolk, because Norfolk is not affiliated to EPSCA; they are allowed to play for an adjacent county. 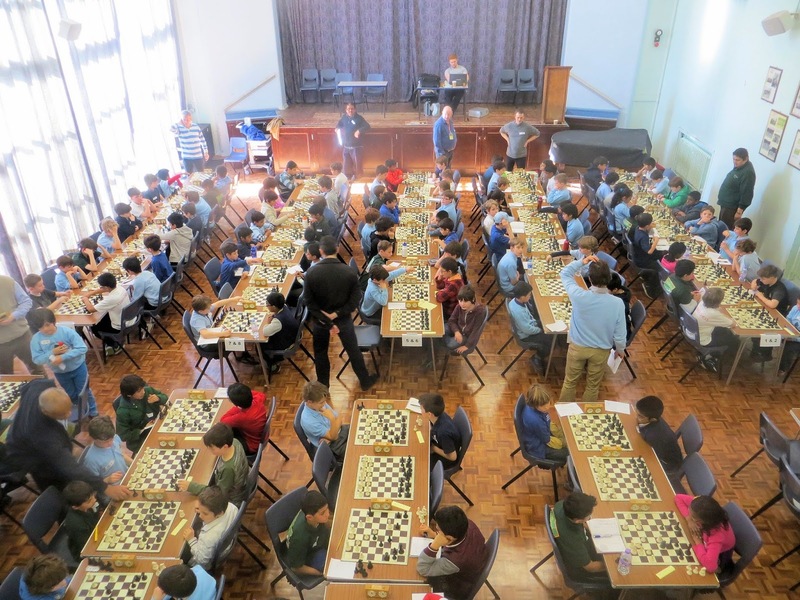 The top three boards will be filled by members of the Bury Knights Junior Chess Club, with 9-year old Anita Somton (ECF 123) on top board, Mario Saenz de Villaverde (100 RP) on Board 2, and Alan John (89 RP) on Board 3. Between them, these three scored 17 points out of 18 in the recent Suffolk Junior Championships. Alan John's father, Boby Sebastian, is the Under 11 Team Manager and has co-ordinated travel arrangements and maintained contact with the parents, many of whom will also be travelling to Chingford on Saturday. Ten new polo shirts, emblazened 'Suffolk Junior Chess' have been purchased to supplement dwindling stocks and each child will proudly wear their shirt, which can either be purchased for £10.00, or hired for the day for £3.00. 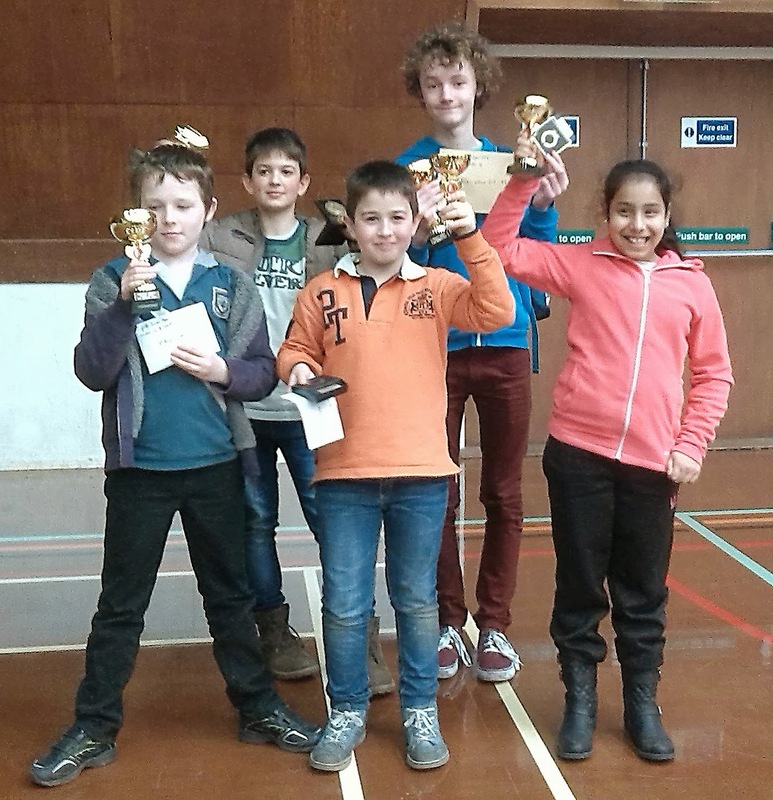 Suffolk will be competing against seven other junior chess associations: Barnet, Cambridgeshire, Essex, Hertfordshire, Kent, Northamptonshire and Richmond It is likely that the top six will qualify for the Final, to be held in Northampton on Saturday 10 May. Last year, Suffolk were seventh out of nine, so only a small improvement is needed! Long-time Suffolk chess players will remember Tony Rubin (pictured left) well (although he looks a bit different nowadays having shaved off his 'tache three years ago). He was an excellent player and a mainstay of the Ipswich Chess Club. But 12 or 13 years ago, he suddenly and surprisingly stopped playing. Tony has been in contact recently, and met up with Michael Clapham for a catch up. Now 58, Tony still plays chess ("not very well") on the ICC site (handle - TonyR). He spends ("too") much of his time playing golf, having more or less retired from ‘proper’ work last year. He is also writing a few questions for the TV show 'Only Connect’ and has submitted questions to University Challenge too, but he is still waiting to hear if they will employ him! 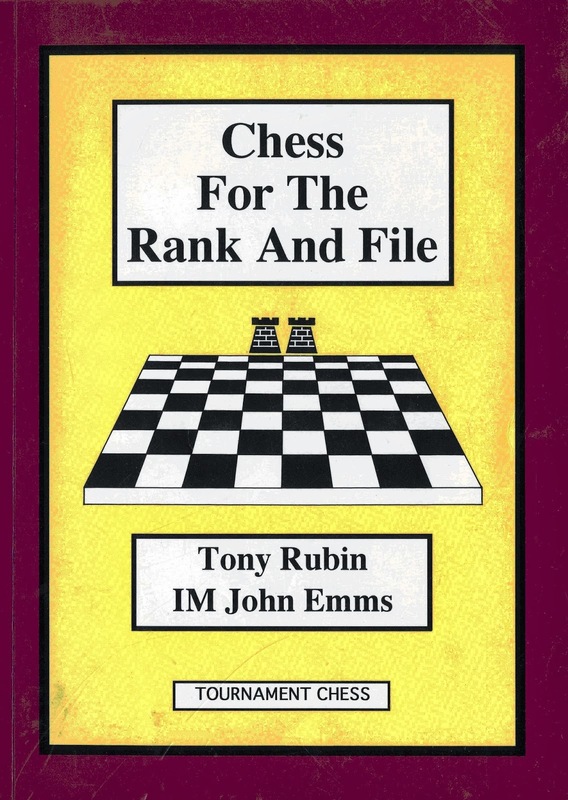 Back in 1992 he wrote 'Chess for the Rank and File', a brilliantly-titled book which detailed his chess career to date. 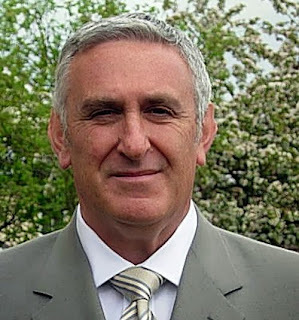 He enlisted the assistance of (then) IM John Emms, who corrected some of the analysis. The book can still be purchased online for a few pounds or dollars. Back in 1998, Tony's grade was 164, which is probably more like 175 with the upgrading a couple of years ago. At his peak, around 1985, his grade was 183. He says he may try and come down to Ipswich and play a few quick games on a Thursday night in the summer. The last two days' articles have provoked a flurry of comments - many thanks to all those who've taken the time to do so. If you haven't already read these articles, please do, as they touch on issues that affect us all - mobile phones and the use of increments (Fischer timing). I'd like to hear your views. Here's a third topic which may provoke some discussion - promotion. With the season fast approaching its conclusion, teams will be nervously watching the league tables, hoping either for promotion or wanting to avoid relegation. In the past there have been several instances of teams declining promotion. So today's question is: Should a team be allowed to decline promotion, or should they be compelled to accept it? The rules state: "The top team will be promoted to a higher division, if there is one. More than one team may be promoted if teams withdraw from a higher division" (Rule 29). The rules don't say that promotion can be declined. There will be situations where a team knows that promotion, if accepted, will be temporary because they will be too weak to remain in the higher division. This may be simply that the gulf between, for example, Division 2 and Division 1 is perceived as too great, or possibly the winning team may know it will be losing a couple of its 'star' players. But should they be allowed to stay in the lower division? It could be argued that if they do so, they will probably win the division again the following season. You're twenty moves into a complicated game, where material is level; both you and your opponent have good chances of winning. Then your opponent's phone goes off. What happens next (or should happen)? According to the rules of the Suffolk League (and the Bury Area League), your opponent loses the game. You get the full point, unless you have insufficient mating material, when the result would be ½ - 0. But in reality, what actually does happen? I've been in a couple of situations in recent league matches where my opponent's phone has rung. In one, he casually lent over to his jacket which was hanging on his chair, turned the phone off and resumed thinking about his next move. I was in a quandary; should I claim the game, or say something, or what? On the other occasion my opponent was more generous. Admitting his fault, he asked, "I suppose that means I lose the game?" It was easy for me to say, yes, I'm afraid it does. And that was that; 1 - 0 to me. But returning to the first instance, it's embarrassing to have to tell your opponent that he has lost the game, which is why I kept quiet (fortunately, I went on to win, anyway). It's absolutely clear from the rules that it's a loss for the person whose phone has made a noise and he/she should resign on the spot. OK, that's the law according to FIDE, which both local leagues have incorporated into their rules. But I'm going to suggest something rather different and would welcome opinions from other local players. Whilst in a tournament, where there is a controller/arbiter, the decision is clear: the player loses. But in a local league, where we all know each other as friends, it does seem a bit brutal to have to concede the game. I suggest that if it occurs in a Suffolk League match, or any of the competitions organised by the SCCA, then the game continues, but that person is banned from playing in the next match for which he would normally be selected. So a regular in a team would miss the next match for that team. That's it; no loss of game, but perhaps a slight loss of face. "Why aren't you playing in the match tonight?" "Oh, in the last match I forgot to switch off my phone and it rung, so I've been banned for this match". How does that sound to you? Let's hear your views. If this idea is generally supported, it could be put as a proposal to the Suffolk AGM on 10 June. As most of you know, instead of playing 75 minutes + 15 minutes quick-play finish, we are allowed to use increments in the Suffolk League. To date, very few people have tried this, although those who have have found no problem with it. If you are using increments (also known as 'Fischer timing') you start with the same 75 minutes, but instead of a quick-play finish, you receive an additional 10 seconds for every move, from move 1. Most games played with increments are slightly shorter than those with a quick-play finish. This is because a 30-move game will take an hour and 20 minutes each, and a 60-move game takes an hour and 25 minutes each. You will need to play 90 moves to reach the same 1½ hours as in a quick-play finish. Very few games in the League last this long. One of the reasons that players reject the use of increments is because the 10 seconds added each move is considered too little time. If you were to run out of your initial stock of 75 minutes, you would have to make a move every 10 seconds, else lose on time. I plan to propose to the SCCA Committee and to the AGM that we change the timings from 75 minutes + 10 seconds per move, to 65 minutes + 20 seconds per move. This has the distinct advantage that you would have longer to think if your time runs out; you would need to make a move within 20 seconds, which is not unreasonable. The 4NCL uses 30 seconds per move, by the way, but with only one game played each day, there's plenty of time to finish the game, even if it goes on for six or seven hours. As has been pointed out before, the main advantage of using increments is that there's no 'Rule 10.2' - the 'two-minute' rule, when you can claim a draw in the last two minutes of your time if you feel your opponent is making no effort to win 'by normal means'. This can cause major problems in a match where there is no arbiter. I would like to know what Suffolk players think of my proposal. A 30-move game would last an hour and a quarter each (slightly less than the current 75 minutes + 10 seconds per move); a 60-move game would last for an hour and 25 minutes each (the same as the current timings), and a 90-move game would extend just over, with an hour and 35 minutes each. If that is seen likely to cause a problem with venues, the initial stock could be decreased to 60 minutes (instead of 65), when a 90-move game would take an hour and a half each. With only one or two matches remaining to be played by each team in the three divisions, there are no guaranteed promotions or relegations yet. Manningtree A are sitting proudly at the top, with a three-point margin over their nearest rivals, Ipswich C. But all teams still have two matches to play, with both Manningtree's being against the Bury St Edmunds' teams. Which team will be relegated is anyone's guess; in theory any team could suffer the dreaded drop. Stowmarket A's match next Tuesday against Saxmundham A could decide which team tops the division with just one match to play. Stowmarket are currently three points behind leaders Bury St Edmunds C. At the other end of the division, Saxmundham have a similar incentive, as they lie 3½ points adrift with the game in hand. Clacton's recent win against Manningtree B has given them renewed hope of winning this division. But they stand four points behind leaders Bury St Edmunds D, with a match in hand. Bury's last match is on 18 March, when they will be the first team to complete their scheduled matches. Their final total will be the target for the other teams. Many Suffolk players will remember Steve Collins. He moved to Bury St Edmunds in May 2007 to live with Donna (whom he'd met at the 2006 Bury Congress where she was serving refreshments). He was an active member of the then Bury Cannons Chess Club. Just before Christmas 2007, Steve suffered a horrific accident when he tripped over in his own kitchen, striking his head against the wall. A broken neck paralysed him and he spent a couple of months in Addenbrookes in Cambridge, followed by a lengthy period in Stoke Mandeville Hospital. During his time in hospital in Cambridge, members of the Bury Cannons Chess Club took turns to take Donna to visit him. When he had recovered sufficiently, Steve moved back to Chelmsford to a nursing home and later lived with his fiancée Vanessa in a bungalow; she was his main carer for the majority of the almost five years from then until his passing. Until recently, Steve was still playing chess - his friends in Chelmsford would take him to the chess club where he played in the North Essex League - and he was very active on Facebook where he last posted on 23 February. A couple of weeks ago he was admitted to hospital with pneumonia. Sadly, yesterday morning, Steve passed away, aged 43. The photo above was taken in May 2008, when visiting him at Stoke Mandeville Hospital. Steve's latest grade was 150, but two years ago, in January 2012, he recorded his highest-ever grade of 165. 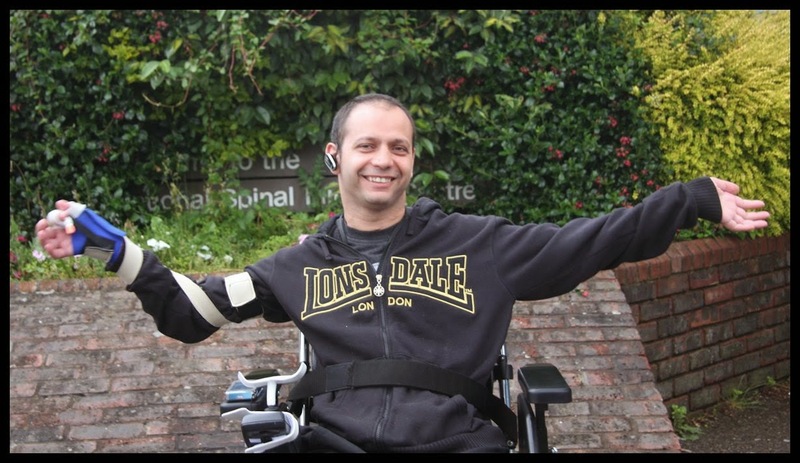 An effervescent personality, Steve did not let his disability get the better of him. He will be sorely missed. 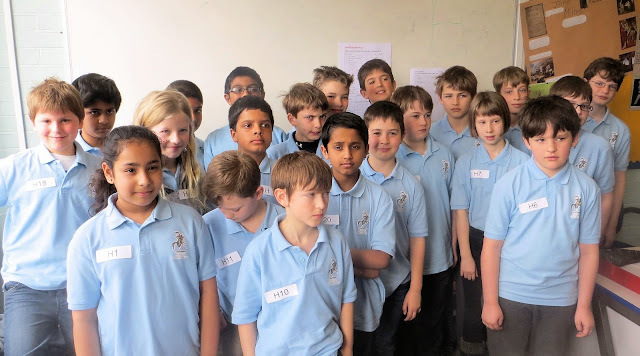 When the Bury Knights Junior Chess Club was formed in 1992, a large number of Patrons provided start-up funding which enabled the purchase of some 60 chess sets and boards. Many of these have been replaced in recent years, but the old sets have been stored at Horringer Court Middle School, where the Bury Knights meet every Friday. Rather than gather dust, it has been decided to offer a small number of sets to local schools who are keen to set up new chess clubs. The first school to take up this offer is Woolpit Primary School. 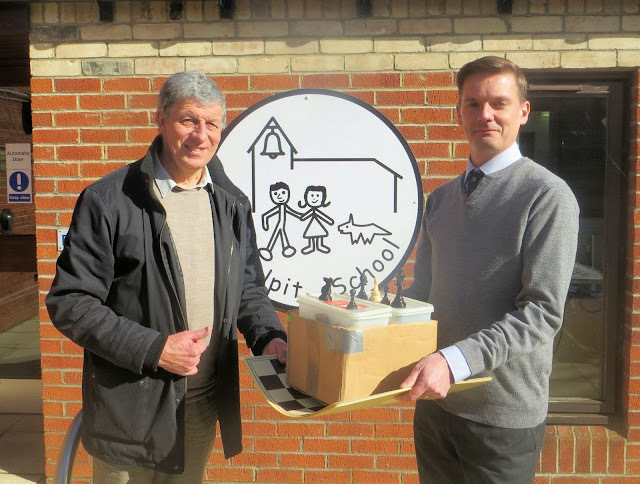 Yesterday, Bury Knights Organiser Bob Jones met with Shaun Holland, Woolpit Primary School's Deputy Head, to hand over six sets and boards. The school's chess club will commence after Easter and Bob hopes to pay a visit once it gets properly under way. Any other schools in the Bury area who would like to take up this offer should contact Bob Jones soon, 'whilst stocks last'! Unsurprisingly, the team prize was won by Bury Knights, with their team consisting of the four boys, Aaron, Mario, Alex and William, who amassed a total of 22 points out of 24. The Open section was won by Justin Tan, who also scored 6/6. With only eight entrants, this section was considerably weakened by the EACU First Team Championship, which also took place on Sunday. This leaves three counties, Suffolk, Cambridgeshire and Norfolk all tied on 8 match points. Had either Suffolk or Norfolk won their match (instead of drawing), then that county would have finished in first place, but the draw has provided Cambridgeshire with an unexpected lifeline. The tie-break calculation has yet to be finalised, but it appears that Cambridgeshire will be awarded first place. EACU Organiser Patrick Ribbands will need to check the tie-break rules before confirming this. Suffolk will probably finish second. There are two places in the National quarter-finals (Minor Counties) and the second place county will be away to the winner of the Western Area Chess Union. This match would be played at a neutral midway venue, probably on Saturday 17 May. More information will be provided here as soon as the decision has been made. The new FIDE Rating list for March has just been published. The following players currently rated over 2000 are eligible to represent Suffolk as they live in the county. Others, including Adam Taylor (Manningtree) and Mike Harris (Bury St Edmunds) live outside Suffolk but are still eligible through membership of their respective clubs (unless they already play for their 'home' county). The March list includes one new entry - 9-year old Anita Somton. 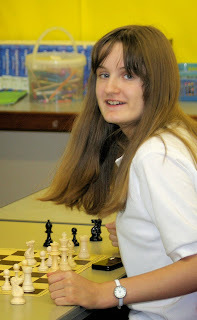 Her first FIDE rating has been set at 1470, which is outstanding for one so young. Not only is she the highest-rated English Under 10 Girl, but also the highest-rated Under 11 and Under 12 Girl. She is also ranked at number 58 amongst all active English women and girls. 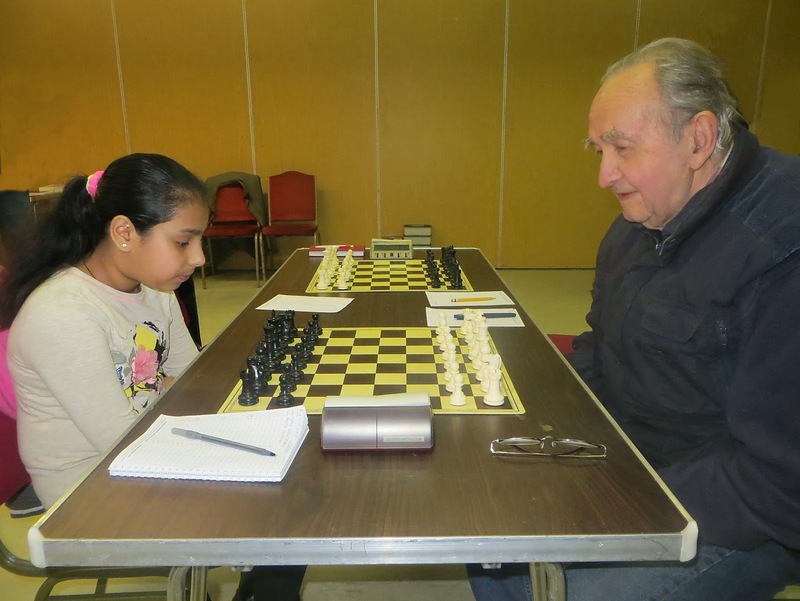 The photo below shows Anita (Bury's youngest member) facing Chas Szentmihaly (Bury's oldest member) before a match in the Bury Area Chess League last Thursday.